Seems like it’s not only humans who are fascinated with babies… for this dog clearly felt the same way too. He keeps on trying to jump off to the bed to see the baby…. but too bad… even after so many attempts, he still failed. Don’t worry cute little doggie, you’ll be able to play with the baby in no time… and you’ll even become best buds in that household. Watch the video below to see this fury white puppies trying his best to climb the bed. This video just shows that humans and animals were mesmerize by this cute little baby. COMMENT and share your cute dog and baby videos. 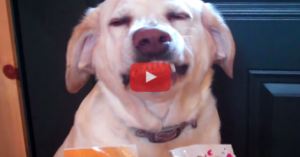 These Dogs React To Accusations Of Destroying The Kitty Treats. The Last Dog’s Reaction Took The Cake! HA!